Sometimes, you just want a simple game to pass the time. It’s even better if you can learn a little bit while you’re playing. 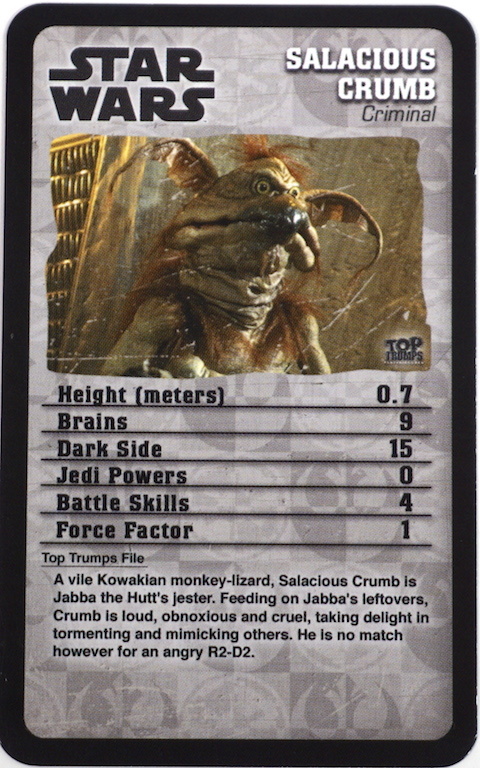 For decades, Top Trumps has been doing its part to fill this need in the UK, but after being acquired by Winning Moves, they are now available in the US. With hundreds of different decks, did Top Trumps rise to the top? Or is it trumped by more complex card games? Learned this guy’s name while playing. Top Trumps feels like the classic card game War, but with a small strategic twist. Each card has 5-6 categories, with a number value assigned for each. To begin, the entire deck is split evenly between all players, so that each player has a deck of face-down cards. You may look at only the top card in your deck. The leader picks one category listed on their current card and reads it aloud. All players compare numbers in that same category, and the player with the highest number wins. As in War, the winner takes all the participating cards. The winner also gets to choose the next category. In case of a tie, that round’s cards are set aside until someone wins the next round. Winning Top Trumps is mostly luck with a bit of strategy. If you can grasp the scale represented by each category, then you should be able to pick the category with the best chance of winning for a particular card. Unfortunately, your best category may still get trumped by another player’s card, so luck still plays a large role here. Collect all the other players’ cards through repeated battling and be the last player standing. 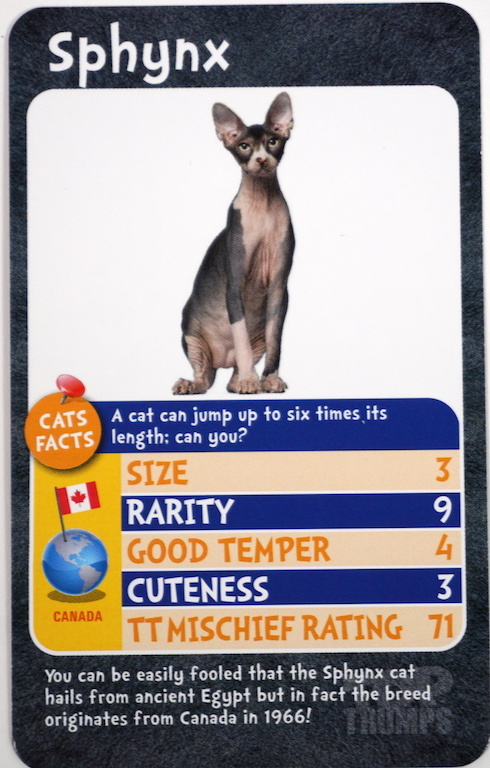 Did you know that Sphynx cats come from Canada? While Top Trumps doesn’t have much strategy, the gameplay is light and fun. The real joy of playing is in examining the cards. Each deck was packed with information about the selected topic, and themed accordingly. Every time we played, we would start talking about the topic and facts we hadn’t known before. With such a simple ruleset, it’s an easy game to pick up and play for anyone who can read. Our kids have really enjoyed playing it. We did find that games tended to run a little long, especially when players go round losing and re-gaining large sets of cards. That’s easily fixed by calling a stop time and counting each player’s cards, rather than playing out to the bitter end. 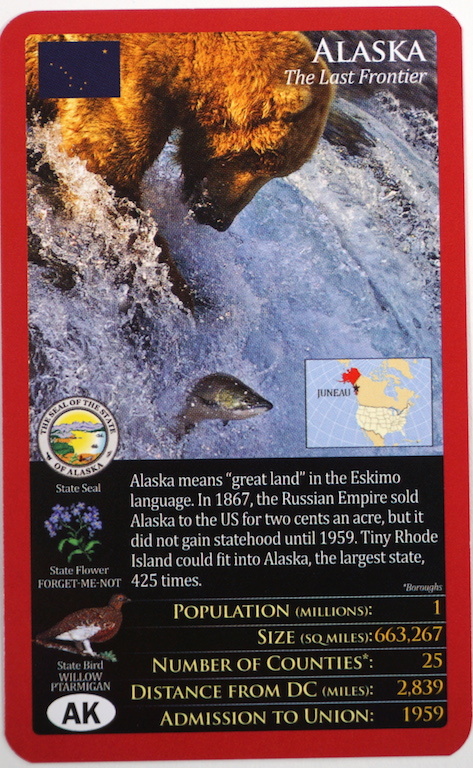 This variation makes Top Trumps a great choice to play anytime your family is waiting around (in line, at a restaurant, at a doctor’s office). As an added perk, many sets (U.S. states, foreign countries, animals, etc.) are truly educational; packed with facts that you can’t help but absorb as you play. Most Top Trumps decks are available for $8 or 10, although I was able to find some as cheap as $5. At these prices, it’s easy to pick up a deck or two for whatever topic sparks your interest, and start battling! 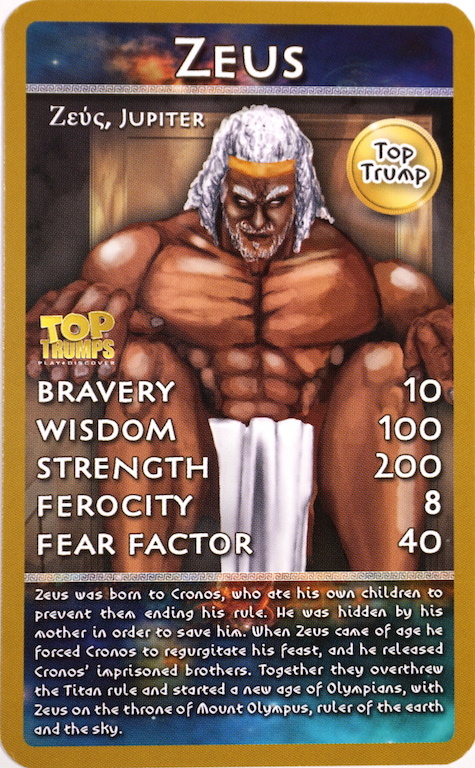 Find a deck of Top Trumps on Amazon or at TopTrumps.com. The Family Gamers received several complimentary decks of Top Trumps for this review.